Little more than 10 years have passed since Liberia began rising from the ashes of a 14-year civil war that decimated its political, social and economic order. While nearly 84 percent of Liberia’s population still lives in extreme poverty on less than $1.25 per day, during Nobel Peace Prize Laureate President Ellen Johnson Sirleaf’s presidency, the GDP per capita has grown on average by nearly 8 percent per year. The country is slowly navigating a development path leading to better health, a stable democracy, an improved domestic agriculture market, and increased exports of products such as iron and rubber. Yet despite some advances, Liberians continue to face a daunting challenge – all too often, when the “rubber meets the road,” there is quite literally no road to travel. 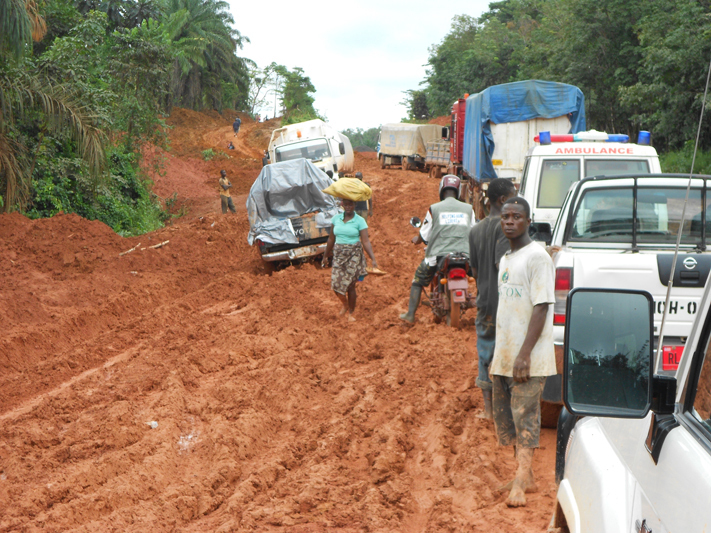 Liberia cannot continue to break the cycle of poverty without an effective road network to connect its people and resources. The country’s infrastructure network represents the most visible symptom of the former conflict, stifling access to markets outside the capital. 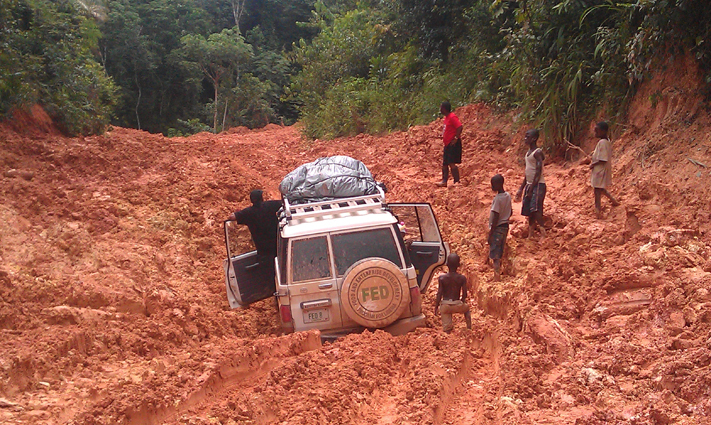 These broken roads decrease the food supply and exacerbate hunger and malnutrition in rural Liberia. Before the war Liberia was a net exporter of rice. 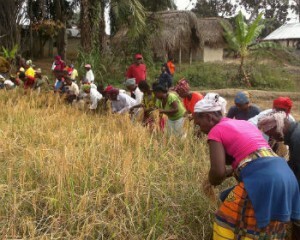 Today, 97 percent of rice consumption in the capital city of Monrovia is imported. Amazingly, it is cheaper, by volume, to ship rice the 7,500 miles from Thailand to Monrovia than it is from Gbarnga, a leading agricultural community just over 100 miles away. Yet Liberia has no intention of leaving their economy stuck in neutral. Our partnership with Liberia, the World Bank, the Swedish International Development Cooperation Agency, and the Japan International Cooperation Agency will provide a total of $240 million in the next five years to improve up to 300 miles of Liberia’s ailing network of roads. USAID helped by first conducting a cost-benefit analysis of which improvements would yield the most positive and sustainable possible outcome for the people of Liberia. Here’s one example of the types of information this analysis considered: When the cost of transportation decreases and the risks associated with traveling these roads dwindle, traders begin to reach these farmers with new information. Fertilizer and improved seeds can arrive at the farms before the planting season, agricultural yields increase, and farmers find it cheaper to deliver produce to the market. Moreover, children will be more likely to make the trip along the road to school, sick individuals can plan a visit to the clinic, and government officials can better reach constituents with much-needed services. In short, the roads provide a number of ancillary benefits, and all must be factored in when selecting the most cost-effective use of development dollars. It is no simple calculation. In the course of one month, the USAID team measured the myriad economic benefits from increased activity along the roads against the costs of road construction and long-term maintenance. Armed with this analysis, USAID began rehabilitation in February 2014, galvanizing access to a better life to approximately 140,000 people who live within a mile and a half of these rural roads, and potentially many thousands more in the broader region through improvements in food security, health, and education. There is strong reason to believe, in other words, that the figurative roadblocks to peace and prosperity for Liberia may be overcome as soon as the actual ones are.